Another month has flown by! 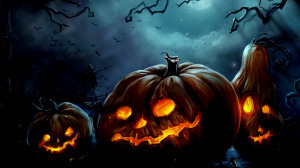 I hope everyone had a great October and Halloween. *Note – I originally sold shares of ESV to get some tax credits and used the proceeds to buy ARCP. I bought 300 shares at $9 and watched as shares went from $8 back to $10. I ended up selling the same day in after hours trading after reading more into the accounting issues. I just wasn’t comfortable holding them. The gain helped me get back a little of my losses from the options I had sold. My net purchases were also a lot lower than usual. I’m hoping to be able to put much more capital to work these last couple of months. I had a lot of options activity in October. I sold new puts in ARCP, BP, UL and ESV. I closed out puts in ARCP (at a loss), and a few ESV puts. One of the puts that I closed at a loss was rolled forward. Basically I sold a new put further into the future to keep from getting that one assigned. In the end it should be a net gain but currently is a loss for this year. My options profits are now looking pretty small for the year compared to last year. I have $10k in my options account currently. My total profit for the year is $199.00. I earned $473.14 in dividends for the month. This is an increase of 49% from the same month last year. My total year-to-date dividend income is $8029.63. This is 80.3% toward my goal of $10,000 in dividends for the year. I’m still on pace to hit this goal. My expected forward 12-month dividend income has increased slightly decreased to $11,793.64 from $11,799.56, a 0% increase since last month. So what the heck happened you may ask since I actually invested a net positive into my account? Well the main reason for the decrease was that I manually fixed the dividend of VOD. VOD doesn’t pay a regular dividend , they pay twice yearly where one payment is about 2/3 of the total while the other is just 1/3. So most financial sites report the dividend yield as too low part of the year and too high the other part. The yield was shown to be artificially high on my dividends page. I’ve corrected this manually but it reduced my forward income enough to cause me to slightly go down. The following 4 companies in my portfolio increased their dividends this month. BP – 2.6% increase (2nd of the year) announced 10/28. I didn’t get a chance to mention this one. I’ve now had 33 companies increase dividends so far this year. No new goals completed. My next goal met will likely be to reach 800k in net worth. All 3 rental properties are still leased for at least 6 more months. I did have an issue with a check bouncing but the renter had a decent excuse and brought cash to me the next day plus paid for the returned check fee. I’m now at $782k, up from $751k. Note that I was at $775k two months ago but I expect my net worth to fluctuate quite a lot due to the value changes I use from Zillow. Speaking of Zillow, I was asked to participate in an article that should be coming out soon. My expected dividends for November are $644 and over $1500 for December. I’m getting really close to averaging $1000/month in dividend income. I hope to hit that milestone in November. I’m still using Motif Investing and made another purchase this month that I didn’t have time to mention. I’m really heavy on AT&T currently with about $7500 invested in that account, the rest spread through the other 29 companies in the DOW 30. When T gets to be much larger I’ll probably spend $5 to re-balance. I’m mainly looking at investing in positions that make up a smaller weight in my portfolio that I want to keep long-term. Some of these include AWR (although they seem to be a little rich here), COP, BBL, APD, GIS, JNJ, UTX and WAG. The sell-off was short-lived and markets are back at all-time highs, So what are you buying? Maybe it’s a good time to hoard a little extra cash. Good work all around! Not sure I agree with the sale of OMI, but each investor has their own criteria and motivations. If OMI didn’t cut it for you personally, then by all means, sell! I also agree with you selling ARCP. Did the same myself, at a loss. I wasn’t comfortable holding them either. Yes, they may be undervalued, I agree, but if they INTENTIONALLY hide accounting mistakes, there’s nothing on this earth that will make me invest in them. Finally, I do like your watchlist. I agree, AWR is overvalued, and I think JNJ and APD are too. The rest are decent. As to what I’m buying, I picked up CMI, and am seriously considering making a mid-month purchase of PCP or PCLN. Maybe SNA, but it looks a bit overvalued though. DividendDeveloper recently posted…What’s in my dream portfolio? Thanks alot! Well, I just didn’t see myself adding to OMI for a while and their dividend growth wasn’t up to par with other medical companies I own. They still aren’t a bad company but I figured I could put the money somewhere that will be more beneficial. Yeah, ARCP scared the crap out of me so I got rid of the stock the same day as the announcement. It was a speculative position and I’m lucky to have gotten out at a gain. AWR just keeps going up. My plan is to add a little at a time until I finally build it up to a full position. That could take a while but I’ll keep averaging into shares. JNJ always looks a little overvalued, you are paying for quality here. I really like CMI, and have wanted to add them to my portfolio at some point. There’s so many good companies. I don’t know much about PCP, PCLN or SNA so I’ll check them out. Thanks for mentioning them. Thanks for the summary. It is very inspiring to see things really taking off for you. 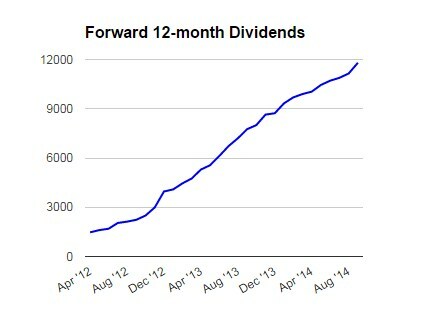 Also, the Forward 12-month Dividend chart is amazing! It should be a very interesting final two months of the year. I would like to see the market hit another rough patch at some point because I would really like to establish a position in Diageo (DEO). I wouldn’t expect that alcohol sales will be slowing down anytime soon and I’m really digging the recent dividend growth. I would also like to pick up a couple shares of GOOG if the price was right. Happy Investing! No problem. I plan to keep posting these updates each month. Unfortunately, I haven’t been able to spend as much time blogging as I want. Maybe I can change that soon. I’m now shooting for over 12,500 in forward dividends since the 14k I initially planned to hit doesn’t look possible. I’m also interested in DEO and was close to pulling the trigger recently. They are a great diversified company and would do well in a downturn. Great month of dividends. PM and MO are really doing some heavy lifting for you. I know the feeling! It has been busy! That’s a good thing I guess, time just keeps flying by. I love the dividend income chart, it just solidifies my views on why I like DG investing. Thanks, I do have a sizable chunk of PM and MO. I think they’ll continue to pay out heft dividends for a long time. There’s nothing wrong with that! I’m pretty comfortable with my tobacco position right now though. A lot of action to say the least. Buying, selling, options, real estate. A full month to say the least. I can’t blame you for dumping your ARCP. It seems that many in the blogging community are split. Some sold, some held, some bought more. If I had owned I probably would have just held and ride it out. Thanks for sharing your recent update. DivHut recently posted…Is It Wise To Buy Stock After A Catastrophic Event? I am impressed, I just begun tracking my dividend income just recently and it looks as though I will reach about $5000 in dividends by year’s end, But I will note that I am not completely a dividend growth investor. Brent, I see you changed the look of the blog, ah the minimalist look . Not there yet with mine, but hey you never know. Thanks. That’s awesome! $5k is a nice chunk of change! I noticed you write about a lot of growth companies. I think a good mix could do very well for you. Well, I moved over to WordPress earlier in the year and haven’t looked back. I think it offers a lot more than I could get at blogger plus I own my own content. It was definitely a busy month. I didn’t make much progress on my forward income but I plan to have a better November and December. I didn’t even own ARCP for a full day, I got a little nervous and decided to dump. Luckily I made out with a little profit. Great that you’re almost at $1,000 per month in dividend income — a good milestone to reach. Thanks for sharing and keep up the good work! I hope to post that $1k/month milestone very soon! Wow! Crazy month there. It’s amazing to see how many operations your have. Business owner, dividend business owner, real estate income, options. You are like an intergalactic monopoly superstar. Keep up the amazing and inspiring work. Also, it looks like the Horns are starting to turn the corner! An intergalactic monopoly superstar, LOL. Thanks for the compliment although I don’t know if I can live up to a title like that! The amount of capital you are investing on a weekly basis is insane! Keep up the good work. I don’t know if I can catch your forward dividend income at this pace but it’s sure inspiring. The horns have been doing MUCH better. The real test will be on Thanksgiving against TCU. That’s going to be a really tough game. Very inspiring month! Good luck on hitting the 10k goal for the year and 1k monthly average. I’m sure you will pass them very soon. I like the additions for the month as well. I ended up picking up BP today to take advantage of the dip in oil prices. Thanks! I’m happy to be able to inspire others to invest. I should have 10k in the bag and hope to hit the 1k average within a couple weeks. I like the BP pickup. I’m honestly thinking of adding another chunk to BP at these prices. Great review and great dividend income. At first the numbers didn’t add up to me, but later when you mentioned you would get up to 1500 in December in dividends it made sense. Congrats on creating almost $1,100 dividend monthly income! It is really inspiring! Good luck in your further work! Thanks. Yes, December is one of my biggest months for dividend income. I have a lot of payers on the Mar/Jun/Sept/Dec schedule. I’m happy that I may be helping others to invest. I’m really close to 1k/month average in dividend income. I’ll be sure and post that milestone as soon as it happens. Good move on selling your ARCP shares. Not sure if I agree selling OMI though. Looks like you’re making excellent progress on your dividend income goal. Very impressive and inspiring to see others ahead of my progress. I’m glad it’s inspiring. You are doing well on your end also.